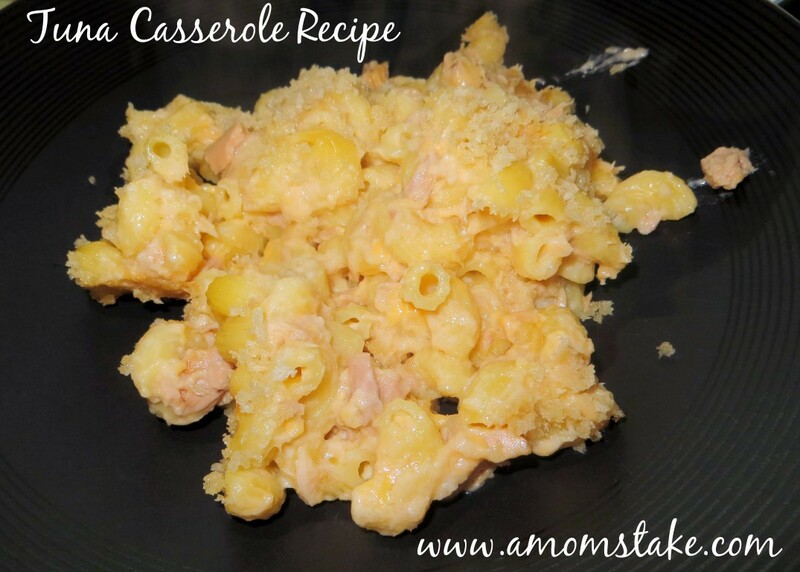 You are here: Home / Easy Recipes / Easy Dinner Recipes: Tuna Casserole Recipe! 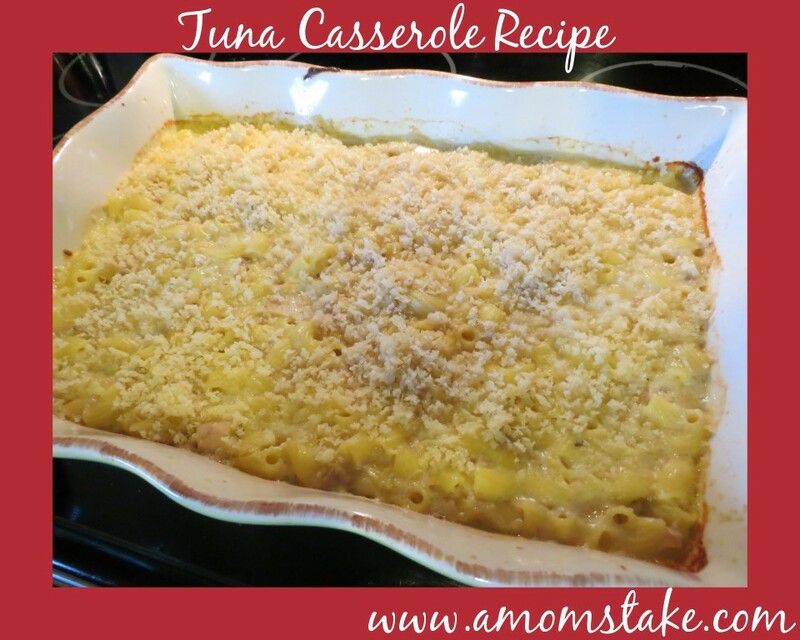 My oldest son’s absolutely favorite meal is this Tuna Casserole Recipe! It’s one of our go-to easy dinner recipes because he absolutely loves it, as do the rest of us! It’s one of very few meals that no one in the house complains about as they all happily clear off their plates of food. The best part is this is my favorite meal to actually cook because it is easy and doesn’t take a ton of prep time but it is very filling and feeds a lot! The original recipe came from Betty Crocker, but of course it has been modified and perfected for our own tastes and preferences to make what we feel is the perfect Tuna Casserole Recipe! Without further delay, here’s the recipe! Start by cooking and draining a 12 oz box of Ronco Hidden Veggie Twisted Elbows Noodles following the package directions. While your noodles are cooking, melt 4 Tbls of butter in a saucepan. When the butter is melted, add 4 Tbls Flour and 1.5 tsp salt. Cook, stirring constantly, until smooth and bubbly. Remove saucepan from heat and slowly add 4 cups of milk. Return to heat and heat to boiling, stirring constantly. Boil and stir for one minute. Finally, add 2 cups of Shredded Cheddar Cheese. Continue to stir until the cheese is melted. Remove from heat and add the noodles as well as 4 (6 oz) cans of Tuna in Water, drained. Pour this mixture into an ungreased casserole pan and cover with tin foil. Bake at 350 for 25 minutes. While your meal is cooking, mix together 2 Tbls melted butter with 1 cup Panko bread crumbs. Sprinkle your crumb topping over the top of the casserole and bake an additional 5 minutes uncovered. My family absolutely loves this recipe and I hope your family will enjoy it too. The panko bread crumbs add a great kick of flavor and texture that makes the whole recipe really delicious. This recipe will feed a lot, which is good because we always want seconds! It also is really delicious as leftovers and reheats really well. Flavorful, delicious, and very filling! Remove saucepan from heat and slowly add 4 cups of milk. Return to heat and heat to boiling, stirring constantly. Boil and stir for one minute. Remove from heat and add the noodles as well as 4 (6 oz) cans of Tuna in Water, drained. Pour this mixture into an ungreased casserole pan and cover with tin foil. While your meal is cooking, mix together 2 Tbls melted butter with 1 cup Panko bread crumbs. Sprinkle your crumb topping over the top of the casserole and bake an additional 5 minutes uncovered. Ronco has introduced a brand new line of pasta that makes sneaking in veggies a bit easier! Now, in their Hidden Veggies pasta, you’ll find one full serving of veggies per each 4 oz of noodles (3 servings per box). The best part is your kids won’t notice the difference as the noodles still look the same with the same color, shape and texture! These were the perfect noodles to use in our Tuna Casserole recipe since the original recipe called for brocolli and my kids refused to eat the original recipe with the brocolli. I can feel good about sneaking in some vegetables with a recipe that I know they love and they didn’t even notice any change at all. Our recipe was still as delicious as ever. In fact, my kids loved the twisted elbows over a traditional macaroni noodle. Ronco Pasta is most common found in and near these major cities: Memphis, Birmingham, Little Rock, Mobile and Nashville. You can save $.55 off Ronco Hidden Veggies Pasta with a coupon offer available on the Ronco Facebook Fan page! Previous Post: « Backyard Beach Fun with Step2 Sandbox and Sand Toys! I would make it with grilled lemon chicken breast, cream of chicken & a tangy blue cheese crumbles. This I could even serve cold & my family would eat it up! Pasta with fresh veggies, basil, parm cheese and italian dressing! I’d made Chili Mac with the pasta. I would make beef stroganoff. Pasta topped with tomato sauce and cheese and baked until the cheese melts. I would make spaghetti with an Alfredo sauce. Eggplant yum- it’s a recipe the girls and I made up. We would use them to make an pesto pasta. I would make a pasta salad. I make a pasta salad that the entire family loves. 🙂 Thank you. I’d make Spaghetti and Meatballs. Plain old Spaghetti and Meatballs! Hubby’s favorite. I make a cold tuna salad with dill relish and apple cider vinegar that would be great with this. I’d make my spaghetti pie with it – thank you. Cheesy Baked ziti with meat. My homemade mac n cheese casserole!!! We would make ziti or spaghetti. It’s been a while since I have made Macaroni Pasta. I would make chicken parm with thin spaghetti. I would make a cold macaroni dish with broccoli and other veggies. The recipe you made sounds delicious to try! I would make mac and cheese for my family with this pasta! I would make baked mac and cheese with bacon! Leave a comment telling me a family favorite recipe you would make with Ronco’s Hidden Veggies Pasta! I have a really good chicken noodle recipe that would be great! Marconiand cheese is a favorite. I would make a noodle salad with fresh veggies and ranch dressing. I would have my husband make his famous spaghetti sauce! My homemade cybisco. The family loves it. 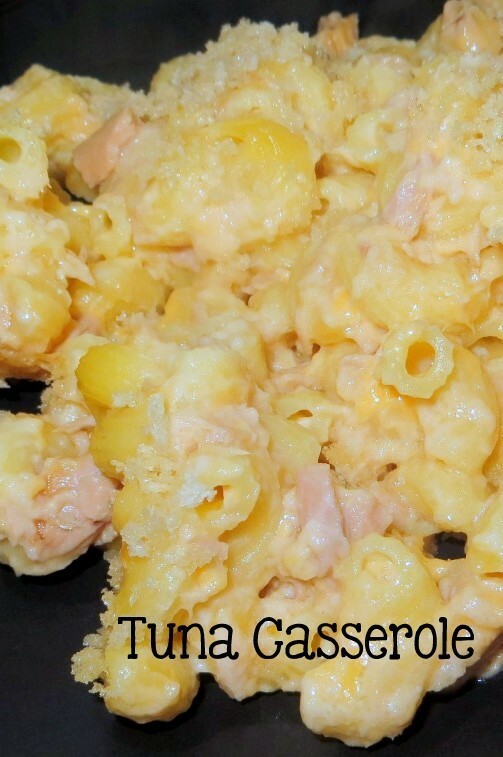 I have never had Tuna Casserole, lol – I would make Goulash! I really love the Veggies in these Pasta products! I make Pasta dishes all the time. Macaroni and cheese would be made a lot! I would make my famous lasagna. I would make macaroni and cheese! I’d make a pasta salad for me—-yummmmm! But I’d make mac n cheese cup for the kids. I make a mean pasta salad with tomatoes and cucumbers!